Whew! Back from Indy and it was a worldwind! It was a great conference and I got to catch up with a lot of old friends and put many faces to names of the individuals I work with in the corporate office on a daily basis. Our schedules were jam-packed, therefore, making it even more difficult to stay healthy but I think I did a pretty good job. I did work out both mornings (the second morning was a struggle - it was the night after our awards ceremony and big bash at Crane bay). What I did not expect was that every meal was planned for us, luckily I was able to find some healthy options. I did stick with yogurts/fruits/oatmeal during the breakfast hour. At lunch, there was a salad bar, so that was easy. The tough part was sitting alllllllll day long and then have 15 minute break periods with multiple snack bars. Confession: I love candy and there was a candy bar filled with all of my favorite varieties. I gave in, dabbling in some peanut m&m's... I figure it was the best choice since the peanuts have protein and some iron... balancing out the sugar from the chocolate. If I chose gummy worms, jelly beans, etc... my insulin levels would have spiked then dropped... leaving me feeling like crap. I bring this up because I read an article on the plane that discussed how the ability to resist, decreases throughout the day because you literally tire from saying 'no' and resisting all day. Makes sense doesn't it? It's easy to resist the donuts at work first thing in the am but at the end of the day when the dessert tray arrives... it's much harder to say no. It's good to stay mindful of this... but also, don't beat yourself up. I'd say on this trip, overall, I made healthy choices 80% of the time (had some candy, desserts, etc. at times when I typically would not)... but not bad considering what was in front of me. I made sure to drink green tea at every break and stay hydrated throughout the day. I stood whenever I had a chance and I didn't have any soda. (ah, though I may have exceed the two drink max on awards night). I also was in bed at a decent hour every night. What I took away from this three day spree of back-to-back events was that I was mindful and didn't forgo my healthy lifestyle just because I had an 'excuse' to do it. 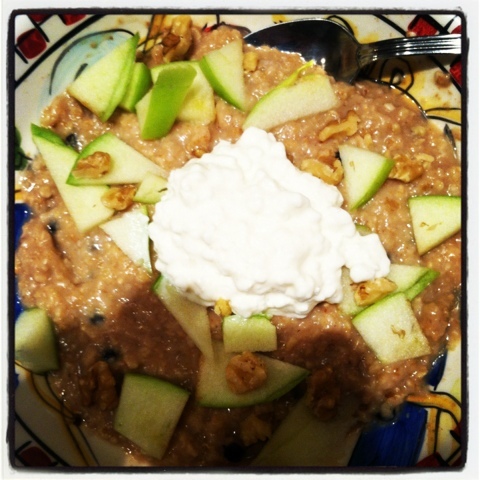 - Cook oatmeal with cinnamon... chop the apple and walnuts... add in and then top with the scoop of cottage cheese... Later today I'll get in a good workout and will probably be back to 100%. Have an awesome weekend!! !